I'm making slow and steady progress. 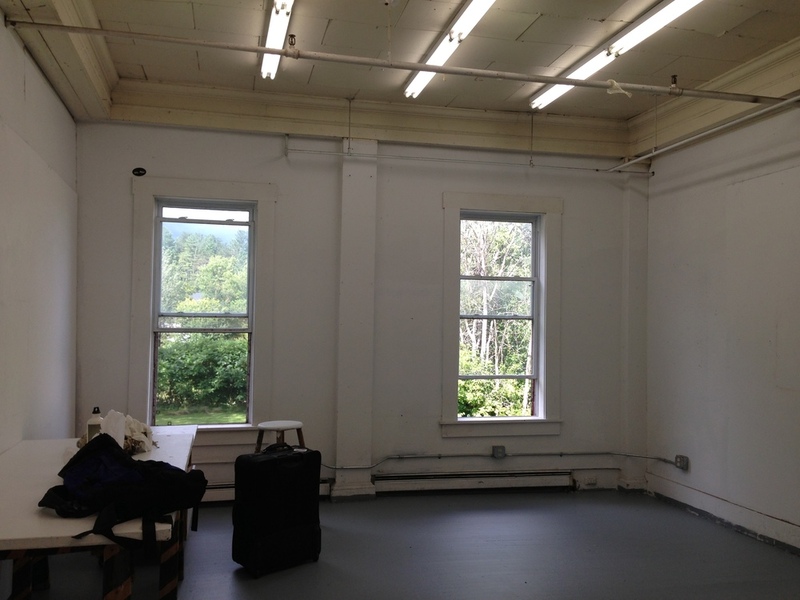 We have less than a week here at the Vermont Studio Center. The main problem-- if it is a problem-- is that there are so many interesting people here doing a myriad of things which I want to talk to them about. For instance, this morning I spoke with Florence Neal of Red Hook, Brooklyn, and Cindy Kim who just graduated from RISD with her BFA and is returning to Toronto to decompress. Florence is doing a lot of beautiful Japanese woodcut printing, and Cindy works across mediums, but mostly is a painter and videographer. Here is what I've got so far. My goal is to finish a painting a day and then start a new experiment on Monday. I basically have until Wednesday and then I leave Friday morning, hopefully with paintings dry:) I don't know if these goals will be achieved, but for good reason, since I'll be heading over to Nick Anger's studio to see some mold castings (he makes exquisite knives) and then to Erika Adams' undercover office hours in the Wolf Kahn building. It's taken me a while to upload this image because wordpress is my nemesis. I don't really know what the problem is but trying to upload images to a new post is like armageddon. And I am on the losing side. Oh crap. Connection lost again. I was going to write more, but I think this is it for me. Fingers crossed that all this works. Started working again on the first cemetery painting which was bugging me a little bit. I had started really abstractly and pushing and pulling at it. I like my tree. I've been working on three biggish paintings in my studio here in Vermont. They are all of cemeteries. The one below is about 23" x 32" and is a cemetery in the winter. I've been experimenting with oil sticks, which I really like, and mushing them about also with bristle brushes, which I don't normally use very much. The application is much thicker than I'm used to creating, but I'm also keeping areas thin and transparent. Below is the second cemetery painting which is 28" x 46". That's not a house but a chapel. The important thing about this painting for me is the atmosphere and mood. It's painted very softly with a lot of gamsol in a watercolor-y way. It was fun to do the tone with acrylic. Because these paintings are for me and for my own experimentation and enjoyment, I've been using a little bit of a cheaper canvas, and gesso-ing myself to save money and to lower the pressure for myself in the inevitable cases I screw up or end up not liking the finished product.